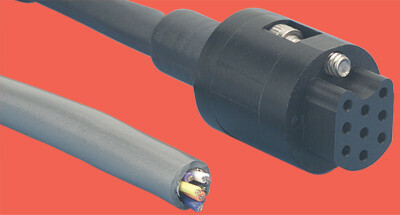 Connector to cable air-service round cable assemblies are fitted with a Delrin® subminiature C female connector at one end and non terminated nine PVC insulated wires on the other. The female cable connectors mate directly onto the air side of 9 pin subminiature C type feedthroughs. The cable jacket is grey PVC with a nominal diameter of 5.8mm. The 9 wires are 24AWG tinned copper conductors, stranded 7 x 0.203mm. Shielding is aluminium / Mylar® foil with 24AWG tinned copper drain wire.